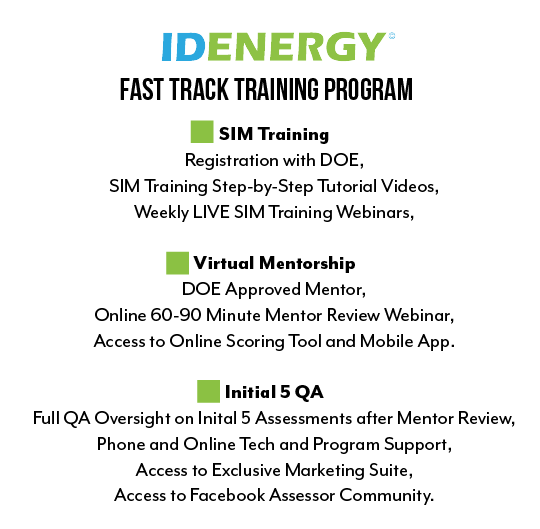 Complete all U.S. Department of Energy Training Requirements with our approved “Fast Track Training” program in 3 easy steps! You Did It! You’re a Certified Assessor! Get started with your Fast Track Training today and become a Home Energy Score Certified Assessor! The Fast Track Training package includes all U.S. Department of Energy requirements to become a Home Energy Score Certified Assessor and I.D. Energy exclusive resources, technical, and program support. Sign up for training today! The DOE and Home Energy Score Program requires that your first or “Initial 5 Assessments” after your mentorship need to receive full QA oversight. Rather than performing a second independent in-field assessment for Quality Assurance, the Desktop QA Auditor receives photos of the home’s key features. Using these photos and other supporting information readily available, the Auditor can verify the data entered by the Assessor compared to the photo evidence. Any points of contention can be discussed through automated notifications and emails between the Assessor and QA Auditor. At the end, this becomes an excellent learning experience for the inspector, and in all ways, helps to shape the inspector’s skills and technical expertise. Find out more about our “Virtual QA Program” here. The Home Energy Score Simulation Training (“Sim”) is like playing a video game. It teaches prospective Assessors important information about the Home Energy Score. Through the Sim, you conduct virtual home walk throughs in homes designed to show a variety of situations you might encounter. Understanding the Sim is vital not only to passing the test homes and written exam, but also to performing successful Home Energy Score assessments and producing Home Energy Score reports. Passing the Sim training course is by far the most difficult and time-consuming portion of the Home Energy Score training for all assessors. Luckily, I.D. Energy has made it simple! I.D. Energy has created “Sim Training Resources” that include in-depth tutorial videos that you can simply follow along to help guide you easily through the training. We guarantee it will cut your time online, at least, in half! In addition to the tutorial videos, the “Sim Training Resources” will give you access to our weekly online webinars, and the ability to post with other assessors on the Home Energy Score Facebook community. To begin training and receive your Sim Training Resources, sign up for your Virtual Mentorship with I.D. Energy today! Use your Sim Training to perform a Home Energy Score on your home at your time and convenience. Use I.D. Energy tips and help videos if necessary to collect the right data. Link to our Facebook community to answer any questions or review comments and tips from other inspectors. You are now a Home Energy Score Certified Assessor. Use the Facebook community to see how other colleagues are offering the score. Get information on real estate presentations, CE for Realtors, flyers, door hangers and so much more. All free to the network. I.D. Energy has worked closely with the U.S. Department of Energy’s Home Energy Score program to design and build an approved remote mentorship program. The Virtual Mentorship allows Candidates to become qualified from right in front of their computer, webinar based, one on one. No more waiting for a field mentor. No more delays or frustration because there is no one within 100 miles of your location to complete your mentorship. Moreover, no more being on your own. The Virtual Mentorship program is not just a way to finalize your assessor qualification, it is also a way to complete the entire knowledge transfer in relation to the program, on a one to one basis with your peers. I contacted the I.D. Energy organization who guided me effortlessly through the final stages of the becoming a Home Energy Score Assessor. The final stage is completing an actual assessment and having a mentor accompany one through the final report. Inspection Depot responded quickly to my e-mail queries to set up a 90-minute overview of the assessment I had complied a few days before. The assessment had to have both video & photos uploaded into the report to qualify the input data. The mentorship (“Go-To Meeting”) had two experienced field experts in the Home Energy field coach & positively critique the assessment & give guidance for future assessments. The whole process is very professional, the mentors are very patient & knowledgeable. I thank them for their time & professionalism. Time is money, Sign Up for your Virtual Mentorship today and start earning tomorrow! After completing the “Sim” Online Training there are three steps to successfully complete the Virtual Mentorship process to become an approved Home Energy Score Assessor.